I am compelled to offer an apology to my customers. 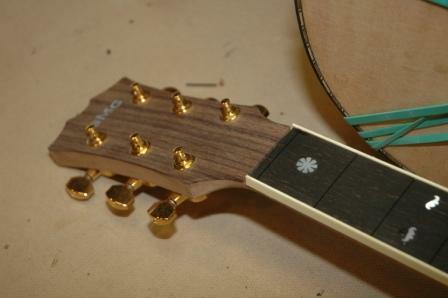 I am developing the prevailing luthier ethic of taking a long time from inception to construction of my guitars. It doesn’t help that I am a full time intern teaching high school math, or that I am enrolled in a program at CityU which has classes, homework, and assignments. I like to read and watch old episodes of Lost, and the dog needs walking on a daily basis. 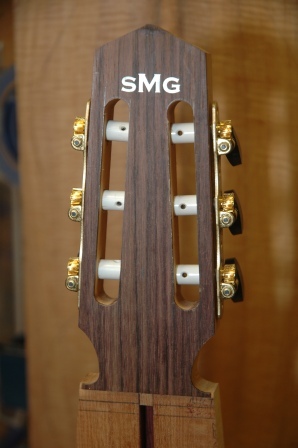 It also doesn’t help that I have 5 guitars/ukes in the pipeline, not to mention the several repairs/restorations which have been ignored in favor of building for way too long. 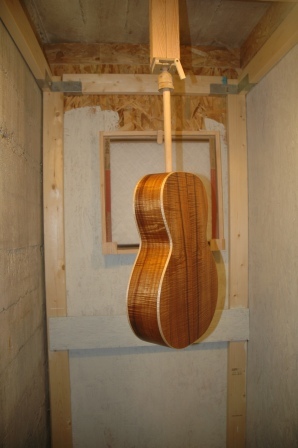 I have a koa dreadnought waiting for the spray booth (I want it to get warmer in the garage, as well as less leaky from the rain). 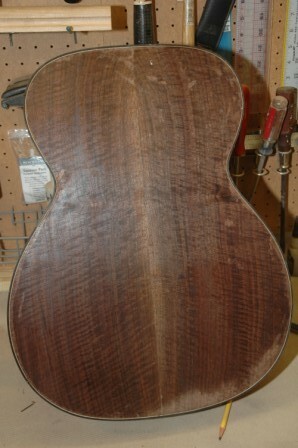 I have an apprentice who comes twice a week, and together we are completing a walnut OM. 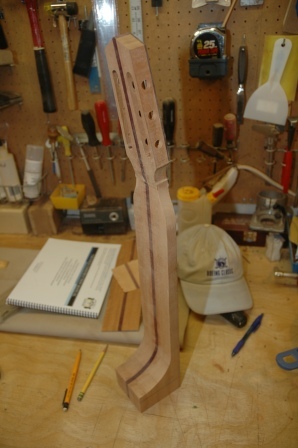 My first uke, a spruce/bubinga tenor, is still in progress, and wants to be ready for the spray booth coincident with the koa dreadnought. There’s the palo escrito hybrid cutaway that gets my attention every few days, and finally a koa tenor uke for my sister, which has some early attention. I ramble here to make amends and assure all of you waiting for your special guitar/uke, that I’ll do my best to deliver as soon as it is possible. The delivery date isn’t as important as the righteousness of my attention. 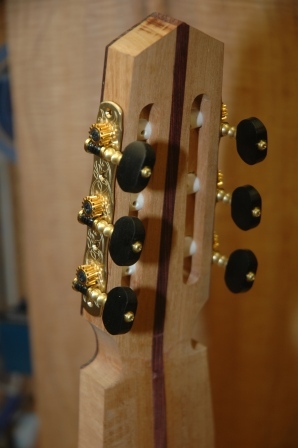 I posted the following question on a Luthier Community Forum. I accept burning as part of the process (I can scrape it off in the end)? My first thought is that the belts are moving too fast. Can you adjust the speed of the belts?? I assume that the feed pressure is appropriate given that you are able to adjust the thickness w/o difficulty. 100 grit is fairly common in this application. Are you sanding with the grain? Sanding with the grain on high resin woods can cause burning. 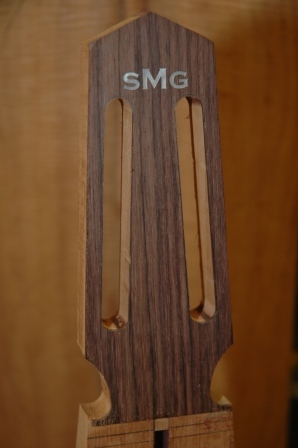 Try sanding at an angle against the grain. The greater the angle the better. I have a Performax 16-32 and found out early on that you need to use a heavy grit (80 or lower) to take the initial pass. After you have removed a bit, go to 100 or higher. This works very well for me. Also, with high resin woods, the paper will not gum up as quickly. If you try to remove the wood with a higher grit, it will burn and gum up. Use a heavy grit to remove the bulk of it, and go to a higher grit to smooth it out. A dust collector of adequate CFMs is a must. That would be the first thing I’d look at. You have to get the dust out of there efficiently as the sanding is happening in order to prevent clogging of the abrasive. If you have a good dust collector on there, then the problem could be the design of the sander – how well it’s designed to maximize dust removal. I have a Woodmaster, which excels in this regard. 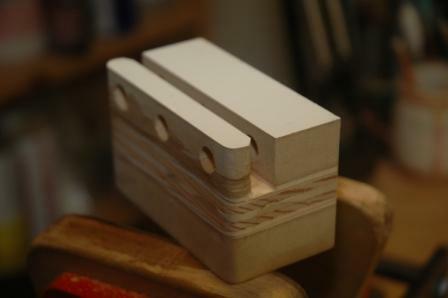 I use the little Performax (10-20) so I have to pass on each side to thickness a plate. I have never had a problem with burning, but I keep my sanding belt really clean (I have a sanding “eraser” next to it and use it about every 4th pass) and use a Grizzly product that comes in 10′ or 30′ rolls for about 4 bucks. It fabric backed and doesn’t loat much anyways. I get 3 out of the small one, if I’m really careful cutting. Also, when wrapping the drum I don’t go right up tight to eachother, but leave a little gap of about 3mm. I find that any dust not pulled into the hose lodges in there rather than the grit. 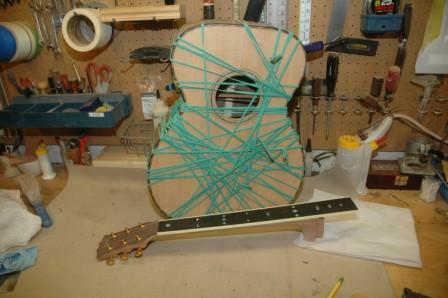 I’ve done Sitka and Englemann spruce, and the hardwoods from mahogany to ebony, no issues. Hope this helps.